I need you to post a recap...I need it! Its nothing special so far, what you'd expect. Talking about how he focuses on pk and faceoffs and working hard. Explained the goal play. How he likes the city and team. Idoit40fans wrote: Its nothing special so far, what you'd expect. Talking about how he focuses on pk and faceoffs and working hard. Explained the goal play. How he likes the city and team. Oh, I've seen that one. Just once I'd like to see a guy come on and say how he focuses on booze and broads, hates practice, the city, and all of his teammates. Oh wait, never mind. Iverson already gave that interview. I was thinking the exact same thing (except for the Iverson part)! They were talking about his goal last night..
"Lightning strikes every once in a while." WWGRD wrote: Funny quote he said.. I liked when he said he could face off lefty too. The Mantis - I really like his new name. MCM seems to like Ziggy, i'm sticking with that. 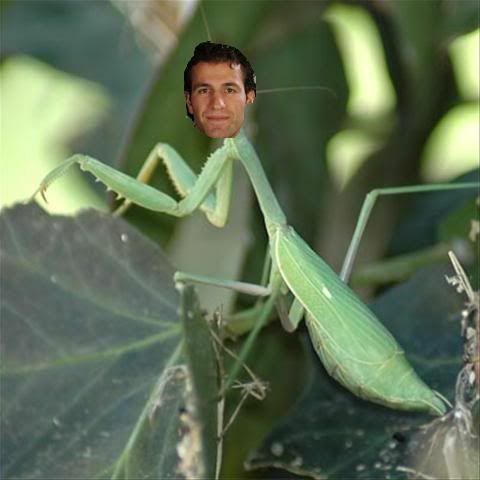 Mike Adams has no choice but to adopt Mantis. The nickname is sponsored by FF. I think i'll log into facebook to make that my new picture. Sadly it will already be the second time logging on there this month, which makes me want to vomit. Idoit40fans wrote: MCM seems to like Ziggy, i'm sticking with that. No, no, no. I hate Ziggy. I hate Ziggy. You got it all wrong. Its ok to tell us what you really think. Ziggy is great.